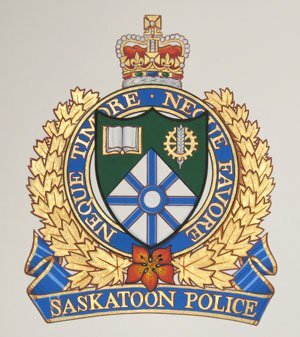 The Saskatoon Police Service is one of only a few police agencies to have armorial bearings, granted by the Chief Herald of Canada. The bearings were granted in July of 2007. 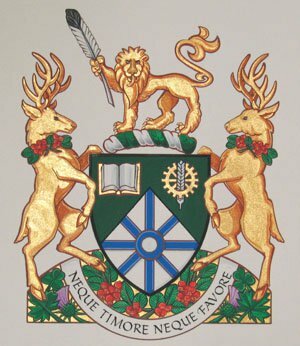 The Arms are similar to the emblem used by the City of Saskatoon, with some changes in colourings. The book represents learning; the cogwheel, industry; the wheat, agriculture; and the wheel hub design in base alludes to the name "Hub City" applied to Saskatoon. The blue is the traditional police colour. The lion is borrowed from the arms of the province. It holds an eagle's feather to communicate a shared link with the indigenous community and to distinguish from the city's crest. The motto means "Neither by fear nor by favour". The motto has been used for many years by the police service. The English translation appears in the Code of Ethics in the form of: "A police officer's duties are performed without fear or favour". The deer supporters are based on the one used as a supporter in the arms of the province because the provincial Police Act governs the operation of the police service. Each wears a collar of Saskatoon berries, also known as "serviceberries," prominent in indigenous culture and appropriate to the city and police. The compartment shows floral items found in the previous emblem of the police service. The style of the badge follows the customary structure of municipal police badges ensigned by the Royal Crown, indicating that the officers enforce the "Queen's peace" and the justice of the Crown. It shows the provincial flower to indicate the province of service.